We suggest you take a peek at Figure 2.15, as it illustrates this point. Notice the interesting one-way fabric print and the simplicity of the design. The designer in this case has observed the fabric surface pattern and lets the fabric speak for itself. The design is uncomplicated, with no design lines to speak of, except for the side seams; too many design lines would spoil this bold fabric pattern. To get acquainted with fabric, the designer also plays and drapes with fabric on the form to determine how it performs when pleated, folded, tucked, gathered, or scrunched. By draping two very different fabric weights, such as silk taffeta and silk georgette, it will become obvious how different each looks on the form. Taffeta is crisp to the hand and when gathered or tucked it holds its shape. On the other hand, silk georgette is soft to the hand, sheer, and delicate, and it drapes softly to skim the body when cut to its best advantage. Fabric” will explain more about the qualities of each fabric type. Sketching is the first part of the design process. It is the fundamental tool used to communicate a seam, a dart, a pocket, a zipper, topstitching, or buttons, so it is not only an artistic pleasure but also a phase during which functional and structural design need to be taken into consideration. for darts, seams, pockets, ruffles, and other design details empowers the designer in knowing how line in design can be used to enhance a woman’s body. Structuring patterns is like architecture-we use line and shape to build form. Making patterns is all about using line, proportion, balance, and shape as each pattern is drafted. Each seam is placed to fit the curves of a woman’s body-placement is not arbitrary. Many students find line placement difficult because they have not thought this through at the sketching stage. Why the Designer Needs to Know HOW to Drape Fabric. Some designers like to draft flat patterns mathematically using specs and measurements, while others like to drape the fabric on the form, then take the draped fabric pieces and make the pattern from them. Draping fabric helps the design student understand the shape of the form and how fabric can be molded to enhance a woman’s body. This in turn empowers the designer with more design possibilities for placing line in the design. Knowing how to cut fabric following the grainlines is essential, as they must be correctly placed parallel to the selvage. Refer to Chapter 2, “Placing the Patterns ‘On Grain. '” Placing the grainlines in certain directions can also change the look of the fabric surface. The fabric surface can have a texture, a bold large print, stripe, check, one-way pattern, or have a furry pile. The designer needs cutting knowledge so that when the darts, seams, gathering, and tucks are stitched, the fabric surface looks its best. The designer needs to learn how to sew darts, pockets, seams, zippers, ruffles, tucks, pleats, waistbands, collars, facings, cuffs, sleeves, hems, and linings, and how to embellish fabrics and stitch closures. All empower the designer by-imparting an overall knowledge of design. Notions and trims are all the supplies needed for constructing garments other than the fabric. Notions can be buttons, snaps, zippers, thread, tape, elastic, ribbon, piping, interfacing, or a lace trim. The designer needs to be involved in choosing these details and therefore needs an artistic eye to harmonize them with the fabric and design. A designer can learn what notions and trims are available by researching the Internet for the latest items. The designer also directs the choice of what basic items to use, such as the type, weight, and length of a zipper; the type, size, and design of a button; and the color of the topstitching. The notions and trims that are used matter, as you will learn by using this textbook. For example, the weight of the zipper needs to suit the fabric weight, and the zipper needs to be long enough so the garment will open comfortably, allowing the customer to get in and out easily. The type of button (glass, metal, wood, or leather) needs to be compatible with the fabric type and suitable for laundering. 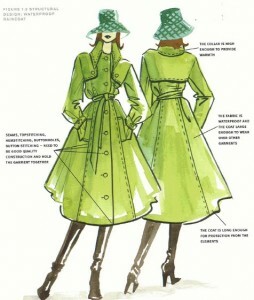 The interfacing also needs to suit the fabric weight and the part of the garment in which it is being used. All these aspects of the construction process will be discussed as you read further in this article. Being involved in production is an aspect of the design process that fashion designers often find difficult and irksome, as they just want to get on with designing clothes and back to the design studio! How involved the designer is with production depends on the size of the company. In a large company the designer’s role in production may be minimal, but students who plan to have their own design business in the future will need to be totally involved. Designers need to keep their eyes open and look at the quality of garments being produced, and at the top of the list is quality stitching. As the collection develops, the designer may be involved with ordering fabrics and trims, an important part of the design process. 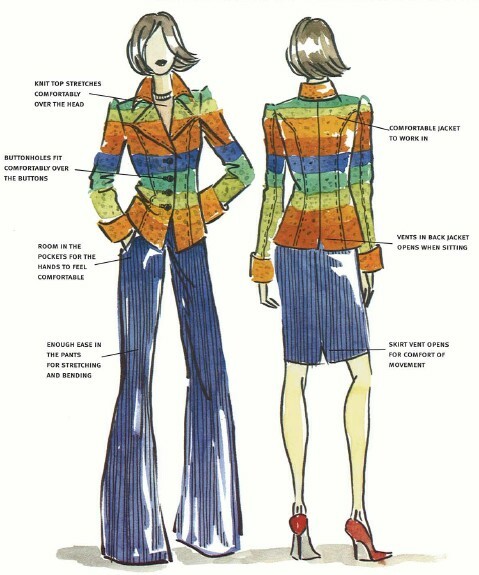 In some companies, designers may also be involved with grading patterns into larger and smaller sizes that are ready for production. When the garments are completed, quality control personnel may also call on designers for their expertise when a stitching or fabric problem occurs. The production of a collection keeps to a strict schedule, and completing your assignments by their due dates is a great way to learn how to organize your schedule. This is excellent practice for your future responsibilities as a designer! 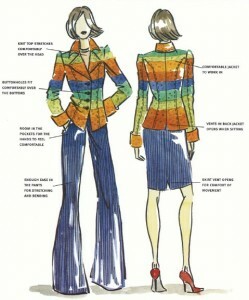 A designer needs to address these three aspects- functional, structural, and decorative design-when designing garments. Eachof these aspects has equal value. If these areas of design are ignored, it can ultimately affect the sale of the collection. And without sales, the designer does not have a job! It is the designer’s responsibility to create clothes that function, feel comfortable, and are user-friendly in the way they work. Garments that represent interesting designs made in quality fabrics that are comfortable to move in, and stitched with quality stitches, are what women want! This is what makes one design and designer stand out from the rest. Coco Chanel, one of the most famous designers in fashion history, knew how important this was. Chanel said, “I make fashion women can live in, breathe in, feel comfortable in, and look younger in.”‘ Her revolutionary designs changed the way women dressed, from being confined to feeling comfortable. As design students, let’s continue Chanel’s tradition! Each of the garments in Figure 1.4, Figure 1.5, and Figure 1.6 demonstrates each area of design: functional, structural, and decorative. Functional Design Functional design refers to how the garment works physically on the body. This is an important aspect on which the designer needs to focus. Garments need to work physically for the purpose they are made for (police or fire fighter’s uniform, ball gown, swimwear, and more). Garments need to feel comfortable on the body and be made from pleasant-feeling fabric. Garments need to provide adequate room for movement yet hold their shape to the form. Garments need to be made in a suitable fabric type and weight to suit the style and provide protection, warmtl?, or coolness.